Sat on the train on the way in this morning and again saw a “crusher” commit 10 minutes of her life to candy crush, like me she wasn’t under 20. Electronic games used to be the realm of teenagers but now thanks to smart phones and tablets they seem to be sucking time from our adult lives too. But how much time? 5.4 million active users a day! 700 million times a day – if that’s true that could be 7,000 million minutes if they each play for as long as my commuting crusher friend. Which seems ridiculous, but even if we just took the 5.4 million users playing twice a day for 10 minutes then that’s 108 million minutes a day. Well, 108 million minutes a day is roughly equal to 30,000 people working 7.5 hours in the same day. Yep, the time spent playing candy crush around the world every day is the equivalent of 30,000 people working for the day! That’s the equivalent of the whole of Telstra or the whole of the University of Sydney. 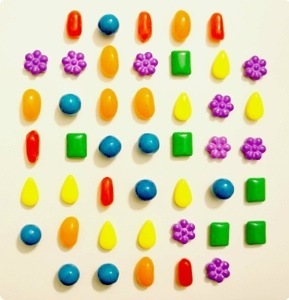 Imagine that – a whole University sat there day in day out playing candy crush. Surely your candy crush time could be spent in a better way! i have no idea what you’re talking about! perhaps i’m far enough beyond 20 to be ignorant. oh and welcome back! glad you’re feeling better. I just think you are showing your age! Why do so many people 30+ make such a distinction between digital games and other forms of entertainment? Why is reading a trashy (or not trashy) fiction novel seen differently from playing a digital game? Or, people will often raise the lost art of face to face communication. Again lots of time spent talking between people is hardly positive. Plenty of talk between people is idle gossip or people reinforcing their own views of the world, again, hardly positive. Digital games are just another form of entertainment that people engage with. If you look at a lot of them they actually encourage the development of problem solving and application skills which is actually a good thing!